"I ain't draft dodging. I ain't burning no flag. I ain't running to Canada. I'm staying right here. You want to send me to jail? Fine, you go right ahead. I've been in jail for 400 years. I could be there for 4 or 5 more, but I ain't going no 10,000 miles to help murder and kill other poor people." 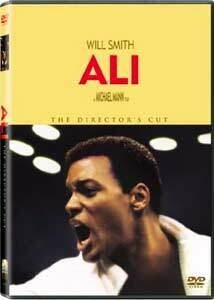 Originally released as a bare-bones DVD in the spring of 2002, Ali deserves a more extensive special edition. My hopes rose when Columbia-TriStar announced its release of the director's cut, which hopefully would add depth to Will Smith's remarkable performance. The changes are very minimal, however, and this version runs only about seven minutes longer than the original film. Michael Mann also cut and re-edited a few scenes in a manner similar to The Last of the Mohicans DVD, but the overall result is basically the same. Thankfully, the theatrical film included numerous memorable scenes, and their effectiveness remains undiminished here. My first review of Ali covered all the significant plot details, so I will not repeat them this time. Instead, I would like to mention several compelling elements that stand out during repeated viewings. The most prominent feature is the understated power of Smith's performance. He was chosen primarily for the fiery, larger-than-life personality needed to match Ali, but he also conveys a quiet determination. The early moments simply present him running down the road, but his strength is immediately evident. Even inside the ring, Smith embodies Ali through more than simple gestures or boxing skills. His entire personality must transform to deliver a worthwhile portrayal. Another noteworthy item is Mann's direction of the boxing scenes, which rank among the best fight sequences in movie history. The first bout with Sonny Liston takes its time and gets us involved without resorting to cheap gimmicks or the obvious emotional shortcuts. The attention to detail and accuracy keeps Ali from appearing larger than life and deftly reveals the magnitude of his victory. This approach works even more effectively in the Foreman bout, which showcases his opponent's massive power without utilizing "Clubber Lang" style camera work. Even the most important scenes never become too much, and Mann keeps the filmmaking in the background to better explore Ali's life. This director's cut of Ali does provide several worthwhile moments excised from the original picture. Jamie Foxx showcases his charming energy as Drew "Bundini" Brown in his initial meeting with Ali. We also witness a few more scenes of the CIA investigating both Malcolm X and Ali that heightens the conspiracy plot. He also shares a cute moment with a young kid that was part of the theatrical trailer but inexplicably removed from the film. Other moments are lengthened and shortened, but nothing really affects the overall tone. It remains a convincing exploration of Ali's life and his place in American history. Image Transfer Review: This 2.40:1 anamorphic widescreen transfer appears to be the same one provided on the initial 2002 release. The film's intimate style does lead to a grainier picture in certain moments than you might expect from a major release, but this is an intentional aspect. The overall transfer is excellent and provides sharp images with very few defects. Audio Transfer Review: This disc offers a 5.1-channel Dolby Digital transfer that also matches the inclusion on the original DVD release. Certain moments are still a bit quiet, but the music and boxing effects spring well from the entire sound field. It definitely helps contribute to Mann's intended "you are there" feeling by enveloping you within the mix of audio aspects. One notable omission is the French transfer, which was offered with the initial release, but has been removed from this version. Extras Review: The most important inclusion with this director's cut is an insightful feature-length commentary track from writer/director Michael Mann. Instead of simply describing the actions onscreen, the intelligent speaker provides plenty of historical background about the time period. This approach is especially helpfuly for younger viewers like myself who were not alive during the events depicted. Mann does have a very low-key demeanor that may seem boring, but his comments reveal plenty of worthwhile details. His admiration for Will Smith is evident throughout the track, as he strongly believes in the actor's skills and dedication to the film. This disc also includes a 28-minute documentary of behind-the-scenes footage and interviews that provides a nice overview. Created during shooting, this feature offers considerable discussions with Michael Mann, Will Smith, and others about the difficulties in creating this biography. The material generally remains on the surface and rarely delves into Mann's specific ideas, but it does give some decent insights. This documentary falls short of being fascinating, but it ranks above the typical promotional junk included on many releases. The Michael Mann commentary and half-hour documentary are nice inclusions, but only devoted fans should buy this one if they already own the first release. The promise of an amazing director's cut isn't fulfilled, and the extras aren't enough to warrant a separate purchase. This version once again showcases Mann and Smith's talents, but it doesn't stray too far from the original experience.